From Linden TN (37096) take hwy TN 13 south from linden and look for Marsh Creek Road on your right. Take Marsh Creek road right (west) until you Cedar Creek Road on your left. Take a left on to Cedar Creek Road and enjoy the ride!! On this route you wind the Tennessee river back country, seeing everything from creeks, old farms, a civil war iron furnace to a Harley in the sky. Great 5 star road with everything from winding, hilly, to curving. Just what every biker wants. See the last double stack iron furnace left in TN. 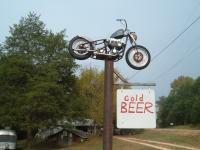 Dating back to before the civil war, the biker bar Hawgs N Hillbillies on the route is a must to stop at, for a cold beer. Also check out their Harley on top of their sign. A five star route with lots of great things to see. on September 10, 2011 6 out of 6 members found this review useful. on November 6, 2013 2 out of 4 members found this review useful. on September 15, 2014 0 out of 1 members found this review useful. Marsh Creek Road getting there is really great too. Cedar Creek Rd is older pavement but plenty of up-hill down-hill. After the Harley on the pole 128 back to Linden is not bad.